Forum Index > Historical Arms Talk > What would break first: sword or mail? Posted: Mon 01 Aug, 2016 6:32 am Post subject: What would break first: sword or mail? This is regarding whether or not it is absolutely true that something that is covered by proper mail armour cannot be cut by a sword under any circumstances. When we don't consider whether or not mail is effective protection against sword cuts under historical combat conditions but solely whether or not a sword can cut through mail does it still hold up? For instance, if you created circumstances where you tried to force it to happen using machinery and preventing anything from absorbing the force could any kind sword cut through mail or would it just break over it? Mail is pretty easy to cut if you rest it against a rigid surface. Mail is not that hard to break, it's getting the force to it that's the tricky part. A cut, for instance, does not attack a single unmoving link, it is across quite a few that slide and shift, at least when attacking a giving target. I can take quite a few links* apart with pliers in an hour, I would be very hard pressed to cut through a similar amount of swords. It also depends on your definition of broken, is the mail broken once a single link is broken, or when none are left? Is the sword broken when it is dulled, or when it's clean through? *modern indian mail, flat or round. Just laying mail on a board and whacking it on the sword won't be realistic, for either. I think it would be safe enough to say that hitting someone wearing mail with a sword wouldn't do that person much good, but the mail (if made properly and reinforced with proper padding underneath) could probably take it while the edge of the sword might take a few dings. I would guess that if you wouldn't break your sword and in most cases, wouldn't break your mail, you would probably render your sword blunt or tire yourself out before getting anywhere. Mail is not that hard to break, it's getting the force to it that' s the tricky part. A cut, for instance, does not attack a single unmoving link, it is across quite a few that slide and shift, at least when attcking a giving target. I can take quite a few links* apart with pliers in an hour, I would be very hard pressed to cut through a similar amount of swords. It also depends on your defenition of broken, is the mail broken once a single link is broken, or when none are left? Is the sword broken when it is dulled, or when it's clean through? I mean when it fails to stop what it's covering from getting cut. A few broken rings are enough for a cut to be dealt. Posted: Tue 02 Aug, 2016 9:34 am Post subject: Re: What would break first: sword or mail? Your question is to vague, redefine it, ask about a specific type of sword and the corresponding mail from that culture. For example, Japanese mail v katana / tachi...or Indian mail v tulwar etc. Take into account that mail worn properly also relied on a layer of cloth underneath and often on top of the mail. Using machinery would of course provide a wide range of results, not all swords are equal in strength and not all mail is of the same strength as well. Posted: Tue 02 Aug, 2016 11:45 am Post subject: Re: What would break first: sword or mail? I don't know if you can say that mail relied on layer of cloth underneath to withstand being slice, one these mail was wore for a long time without any specialized shock garments and almost all armor wasn't wore over bare skin for a variety of reasons. Posted: Wed 03 Aug, 2016 8:50 pm Post subject: Re: What would break first: sword or mail? The Japanese hauberks were always sewn to a cloth backing and Indian hauberks were known to have been sewn to a cloth backing as well. Both were at times also completely enclosed by cloth, the Ottomans did the same as well (jazerant), way less likely to cut through mail when it is enclosed by cloth. Posted: Thu 04 Aug, 2016 8:49 am Post subject: Re: What would break first: sword or mail? But the Vikings , the Etruscans and Celtic tribes, who invented the armor, just threw it over a whatever they would have worn as civilian clothing. Also, I don't think using the japanese is a good example because most of their mail wasn't riveted, it was butted or twisted iron rings which allot less robust that riveted links. here are other reasons to were clothing under armor besides protection, for one, the very hot metal against you flesh can sheer your skin, There is nothing between your sweat and your very expensive piece of armor, reducing it's service life, less likely to have an oils or abrasion on your skin when moving around, etc. The two layers of clothing in between mail could also act as a dust and dirt cover, making it easier to be cleaned and to keep the sun of it. Also, making your armor look like civilian clothing from a distance could save your life because it could encourage a enemy archer to choose the wrong arrow head or aim at your armor, the same way police and sway move into room to encourage the criminal to shoot center mass, into a vest. Posted: Thu 04 Aug, 2016 11:38 am Post subject: Re: What would break first: sword or mail? But the Vikings , the Etruscans and Celtic tribes, who invented the armor, just threw it over a whatever they would have worn as civilian clothing. What's your evidence for this last statement? Given that fabrics of any kind very rarely survive from these periods, and the general lack of any written statements as to what they may or may not have worn under mail, how do you know they just "...threw it over whatever they would have worn as civilian clothing." Posted: Thu 04 Aug, 2016 1:36 pm Post subject: Re: What would break first: sword or mail? That, by means of logic, proves it for now. There is no evidence that dedicated padded garments did exist, no excavation or inventory , or artwork, no mention or dedicated infrastructure and tradesmen. Also, no mention or dedicated shock inducing weapons in these periods and geographic location. In logic, it is common rule of logic that there is greater burden on someone trying to prove a positive than a negative. Thusly, it is more logical to concluded that they have a much higher likelihood of not existing than existing. So, given that, it isn't a huge leap to conclude that they just threw mail over what they wore walking in day to day life. Posted: Thu 04 Aug, 2016 3:43 pm Post subject: Re: What would break first: sword or mail? That is not a logical conclusion at all. You made a flat assertion that they, "just threw it over a whatever they would have worn as civilian clothing." While that is not really an unreasonable assumption (even if I think it wrong), it is in the end only an assumption. That is a far cry from your statement, which is written in such a manner as though it was a proven fact. That is why I pressed you for a more explicit proof. Clothing of any kind is rarely found. My point in bringing this up is that the fact that no (or actually very little) physical evidence is found means nothing. Scores of thousands of mail backings might have existed and yet none might survive, given the odds of survival are so low for textiles. So lack of "excavation or inventory" is utterly meaningless in the context of the Celts and Vikings, especially. What kind of "...dedicated infrastructure and tradesmen..." is to be expected for the Celts and Vikings (in particular)? For the making of a textile mail backing, will proof of the existence of looms and actual textiles suffice? 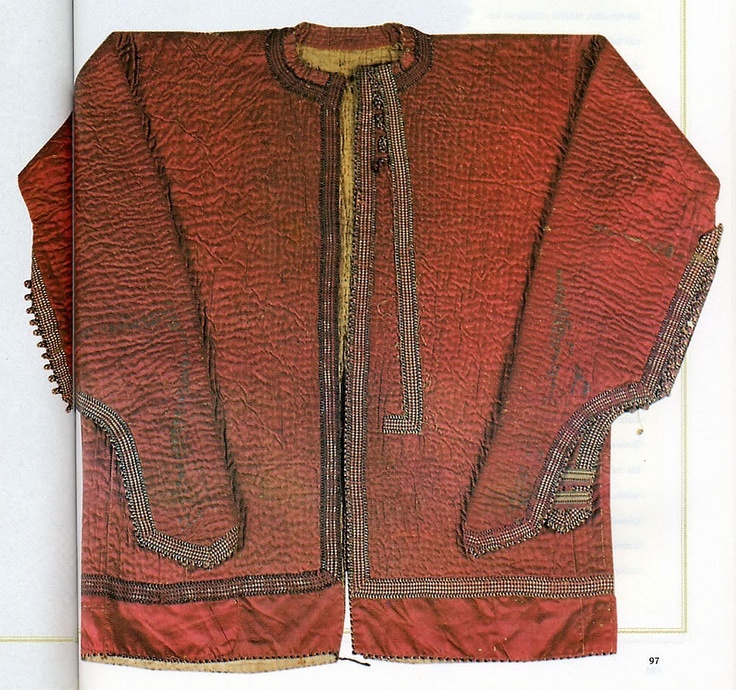 What differentiates the "infrastructure" used to make a tunic vice that used to make textile backings for mail? You also fail to note that the Celts and Vikings, at least, were largely illiterate. It is highly unreasonable to expect "written statements" from peoples who had no wide spread literacy and did not keep bureaucratic records. It is not correct that there were no "...shock inducing weapons... " from the Viking Age. Maces are well-attested in the latter part of the Viking period, and axes are found throughout which have similar mass distribution. Going beyond that, I could probably produce much the same "shock inducing" effect with a solid spear thrust. Indeed, I have little doubt I could crack ribs or the collar bone through unbacked mail with even a relatively light spatha or similar sword, which could easily take one out of the battle. While mail by itself will help dissipate some of that force, it won't take care of all of it. Backed mail, though, should easily be able to stop that, and more. Can you even define "shock inducing" in scientific/clinical terms? How many Joules per square centimeter are we talking about? How did you arrive at this figure? Keep in mind that a baseball bat has about as much raw K.E. as a .22 round, but it can certainly deliver a massive degree of "blunt trauma." I should also point out that physical evidence exists for mail backing from Dura Europas, which can be fairly solidly dated to when the city fell in 255 A.D. Note that in this period "shock inducing" weapons were not really well attested either, yet warriors in that time frame seem to have seen the necessity for padding - and in a hot desert climate no less. Logically, therefore, we should not dismiss the possibility that, given roughly the same conditions among the Celts, Vikings and Etruscans, some sort of backing may have been used. Finally, in Knight in the Blast Furnace, Alan Williams showed that unbacked mail suffered broken rings and some degree of penetration, which did not occur with backed mail. So we have physical proof that (a) warriors who faced pretty much the same threats as Celts/Vikings/Etruscans wore backed mail and (b) mail provably suffers significant diminishment of protective value without backing. Also, (c) the assertion that "shock inducing" weapons did not exist is simply not factually correct. While I do not consider the above points at all conclusive, it is more evidence for use of backing, then against. In summary, while I do not consider the existence of mail backing to be in any way proven, there is no real basis for concluding the opposite. The best that can be said is that at this point is that the evidence is limited and inconclusive. More research is needed before even attempting to assert one way or the other. Posted: Fri 05 Aug, 2016 5:57 am Post subject: Re: What would break first: sword or mail? I don't think using the japanese is a good example because most of their mail wasn't riveted, it was butted or twisted iron rings which allot less robust that riveted links. Actually I think that Japanese mail is a very good example...if butted / twisted links sewn to a cloth backing was sufficient to protect the wearer from a sword attack how much harder would it have been for a sword to cut through European / Indo-Persian riveted mail with a cloth backing. Posted: Fri 05 Aug, 2016 6:06 am Post subject: Re: What would break first: sword or mail? That is not a logical conclusion at all. You made a flat assertion that they, "just threw it over a whatever they would have worn as civilian clothing." While that is not really an unreasonable assumption (even if I think it wrong), it is in the end only an assumption. That is a far cry from your statement, which is written in such a manner as though it was a proven fact. That is why I pressed you for a more explicit proof, which, in spite of your lofty sophistry, you don't have. Clothing of any kind is rarely found. A very good observation, other than quite a few Japanese examples, very little clothing associated with mail armor exists, there are a few Indian examples and I know of only two jazerant examples, and how many European examples are known to exist? It is hard to come to any accurate conclusion with so little information to work with. Posted: Fri 05 Aug, 2016 10:18 am Post subject: Re: What would break first: sword or mail? You will stop the personal attacks immediately. While we welcome debates about the subject at hand, we expect no personal attacks, name calling, snide remarks, or any of that other nonsense. Keep it professional. To be clear: ad hominem attacks are inappropriate for this forum. Attack the position, not the person. Simple. Take time to preview the posts you make. You guys have misquoted people here. I've tried to fix some of it, but honestly, this topic was a mess. Our site forces members to preview before they can post to avoid this very thing. Read your posts before you submit them. I don't want to have to clean up after you. Should anyone have any questions or comments, write me a PM. I don't want to see the topic cluttered with anymore garbage. Hopefully this won't derail the topic, but as Arne G has brought up the tests done by Alan Williams. These tests are often used online to "proove" that mail is significantly less effective (or even useless ) without a padded layer underneath it. Now I'm not doubting that padding will increase mails effectiveness, but can anyone here tell me how much padding was used in this test? If for example, it consisted of ten layers of linen. Then wouldn't this make it sufficient enough to be considered a secondary layer of armour, rather than an arming garment? Also was another test done where no padding was used to compare the results, and if so was the mail in this test placed over a layer of linen and a layer of wool to simulate clothing? Quilted jack, 30 layers of linen, 9.1kg per square metre. The same jack was used under mail for the tests described on pg 942 and then as standalone armour for the tests on pg 943. The tests were on modern mail and a sample of antique mail. Both were tested with the jack, and not tested without the jack. Thanks Timo. So if no tests were done without the jack underneath, then we have no idea (from these tests at least) how well mail performs over everyday clothing or minimal padding. Also a 30 layer jack is way too thick and heavy to serve as an arming garment for mail. In the 15th century it was considered a sufficiently effective piece of armour in its own right. I haven't read The Knight and the Blast Furnace, but l remember someone on a different thread saying that the jack and mail combo tested by Williams required 170J to be defeated by an arrow, and that the jack was estimated to contribute 80J out of this 170J. Now knowing that the jack was made of 30 layers, it makes perfect sense that it would provide nearly half of the defensive capacity. Essentially what was tested was two pieces of armour worn together, not a single layer of armour with a padded under layer.